Kick start your pre-season training! AFTER A few weeks off, it’s time to start preparing your body for next season. Pre-season training should be tough, but if you put in the hard work now it’ll stand your body in good stead for nine tough months of rugby. 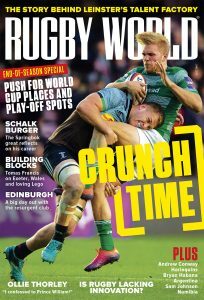 In the July edition of Rugby World, our fitness guru John Dams sets a workout to get your new regime up and running. Here’s an additional warm-up exercise for your gym session – give it a try!